I've decided to start a new little tradition on this blog. On the first of each month, I'm going to list out my goals for the month. Then, on the first of the following month, I'll list out how I did with the previous month's goals as well as new goals for that month. With just having moved into the house, there are so many things I want to accomplish and I feel like I have lists everywhere. Hopefully this will help keep me accountable, and it will be fun to share my goals and progress with all of you! Since this is my first month, I don't have any progress updates for June. My internal goal for June was just to keep my head above water, so I am pleased to say I accomplished that. Parker and I unpacked in 2.5 days, which was pretty quick for us, but it also meant we didn't find places for everything immediately. Any decorative items we didn't know where to put went into my office closet. So the house looks unpacked... until you look in the closet. We have a pantry! I haven't really had a pantry the last several houses, so I am on cloud 9 over here. When we moved in, I just stuffed food any and everywhere I could find a spot in the interest of time. It looks like a food tornado struck in there. I'm a little embarrassed by this picture, but hopefully the after shot will make up for it. I have been really into running lately, and this goal will help push me to keep up with it. 4. Make Jenny a food storage container with her silhouette on it. I made one for Darla several months back but for some reason never got around to making one for Jenny. Jenny's food zips closed and Darlas didn't, so I wanted to get hers into an airtight container asap. Now that we are moved, I want to do the same for the Jen pup! I love the silhouette on Darla's! She was not impressed with being placed in her container. 5. Publish at least 20 blog posts. Blogging definitely took a backseat last month. I am honestly amazed at how many posts got published. It just felt like we were constantly running on empty over here. This month, I want to blog at least 4 times a week, and preferably not write each post at 10 PM the night before. 6. Figure out a good space filler for our long hallway. I'm thinking maybe two large canvases of a wedding portrait/family picture? I'd love to know what you have done for a hallway! No explanation needed here. I want a weekend where we have absolutely nothing planned, please! I love goal setting. I refuse to do it for New Year's, but I pretty much have a running to-do list that rep my current goals at all times. Luckily, I knocked most of mine out because our new baby will zap every desire I have to do anything around this house, haha. i have a lot of cleaning and organizing to do as well! annnddd 31 miles in 31 days GET IT! Yay! So glad you jumped on the goal train, ha! :) Mine are up today as well, and even though I've failed to accomplish a goal or two each month, I love the accountability it has and it just keeps pushing me. Your list sounds great!! Good luck this month! How cute is that silhouette! I think these are awesome goals. 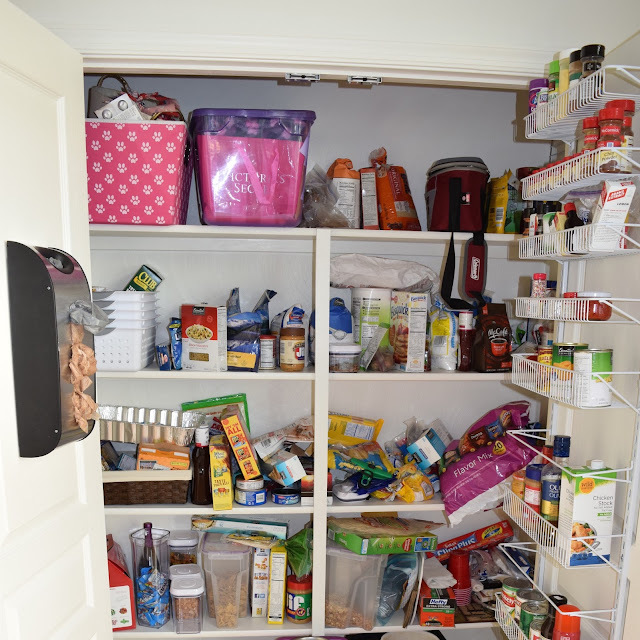 My pantry needs an overhaul too. Love that pic of Darla in her food container! So cute! I love Dollar Tree containers for organizing my pantry and freezer. They're cheap, and they're a great size for the shelves. I don't have a pantry...but my cabinets are in desperate need of an organize! Such a mess. I especially like the dog silhouette! How fun! We have a long hallway in our new house too that I am not quite sure what to do with. And if it makes you feel better, our pantry is just like yours if not worse because Tom has a tendency to go in there and snack and not close lids/tops.